Using the Web app is as easy and free. You enter in any Twitter account and hit the check button. The app will calculate for you three different percentages. 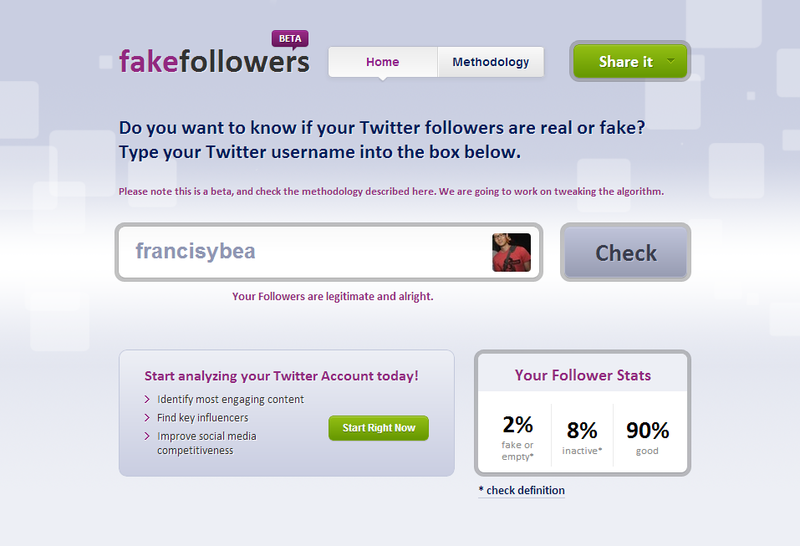 The first is the percentage of “fake or empty” Twitter accounts. The second are the percentage of inactive accounts. The final number is the percentage of legitimate accounts. Celebrities and corporate accounts, Rezab tells me, tend to have a greater propensity for fake accounts. Take for example Justin Bieber’s Twitter account that has over 31 million followers, which has a proportionately lower percentage of “good” accounts. 27 percent are fake or empty, 12 percent are inactive, while 61 percent are “good.” Breaking this down, with 31,127,591 followers at the time of this writing, “Fake Followers” is estimating that in reality Justin Bieber has 18,987,830 actual followers (plus or minus 4.6 million users taking into consideration a 15 percent deviation).